You are here: Home / News / If Eurocentricity Is Wrong How Can Afrocentricity Be Right. If Eurocentricity Is Wrong How Can Afrocentricity Be Right. (ThyBlackMan.com) Ponder this for a moment. If Eurocentricity is wrong, how can Afrocentricity be right? Eurocentricity is a form of ethnocentricity which, by definition, is pernicious. Thus, by the same token shouldn’t Afrocentricity also be seen as negative? Dr. Molefi Kete Asante says that “the Afrocentric analysis re-establishes the centrality of the ancient Kemetic (Egyptian) civilization and the Nile Valley cultural complex as points of reference for an African perspective in much the same way as Greece and Rome serve as reference points for the European world.” So is he saying Afrocentricity is but the mirror image of Eurocentricity? But how could that be, though, if Africa, and African civilization, is truly primary for all others? Humanity had an African genesis, and so too did civilization. When there were only Africans there was no Afrocentricity since there was no “Other.” There was no need for Africans to be centered in their culture since there was no other culture for them to possibly be centered in. The European tradition appreciated its African roots, that is, until the Age of Empire with its colonialism and slavery. In order to rationalize the barbaric treatment of others, a virulent Eurocentrism was spawned that distorted and denigrated non-European cultural forms and fabricated history. Afrocentricity developed as a counter to Eurocentricity, as a reaction to it. Thus Afrocentricity truly is the mirror image of Eurocentricity in every sense of the word. A mirror, remember, not only reflects, it also reverses. Afrocentricity is a thoughtfully constructed philosophy, Eurocentricity something few would even admit to. The minority group’s ethnocentrism is openly stated, in fact, celebrated. The majority’s ethnocentrism is quieter, yet nonetheless the dominant, governing force. However, confronted with its own reflection, Eurocentricity gradually gives ground. The institution of Black Studies departments on many college campuses in the wake of the rising consciousness of the ‘60s was an example of Eurocentricity giving ground. 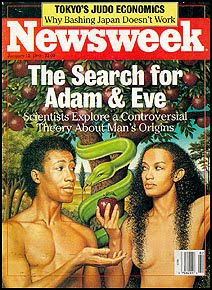 Decades later, articles in the popular press admitting humankind’s African origins and picturing Adam and Eve as Black (Newsweek 1/11/88), and pieces stating that the founders of the Pharonic dynasties were Black (Newsweek 9/23/91), also exhibited Eurocentricity pulling back. Afrocentricity developed as a counter to Eurocentricity, as a reaction to it. In a relentlessly racially charged atmosphere, Afrocentricity attacks the clear bias of the academic establishment with, not surprisingly, relentlessly racial arguments. Afrocentricity holds up a mirror to Eurocentricity, and Eurocentricity shrinks in the face of its own reflection. Afrocentricity is potent in that it attacks and destroys Eurocentricity, but it is necessarily flawed because it is necessarily ethnocentric. To claim that humanity, science, civilization and religion were begun by Blacks is not an Afrocentric statement. It is simply the truth. However, many who espouse this adopt the misnomer, “Afrocentricity,” since they picture themselves as David battling their diametrically opposed opposite, the Goliath that is Eurocentricity. In doing so, though, they put the truth of African primacy on the level of Europe’s mythical history. I say this not to put down the Afrocentrists, but to flesh out the nature of their valiant quest. We should also point out that many of us, no matter how much evidence we are shown, will not truly believe, and accept, the empowering truths of African accomplishment. Again, this not to put Black people down, but to show that we have been so deeply conditioned that unless, and until, the very establishment that maintains the status quo admits our accomplishments, many won’t believe what we have done in the past and can do now. That is the curious Catch-22 that the Afrocentrists are fighting against. In vain? Well, that remains to be seen. All that is certain is that the revolutionary change of mind required of us will surely not be televised. We must change the program. No one will save us but us. All knowledge is self-knowledge. Know Thyself. . . This talented author has just published a NEW book which is entitled; AFRICA is not A COUNTRY!. For more articles written by this talented brother click on the following link;http://thyblackman.com/?s=lewin. Pelvo White, I agree. The only question is how. And once we do define what it is to be “an American,” I believe all the tension and conflict among the various races and ethnicities in the US will subside. And as the US goes, so too will the world, for increasingly, we are the world and the world is the US. When we become one nation, the world will become one community. So we see the Black struggle is hardly a parochial matter. It is of crucial import to the fate of the planet. America is neither wholly Eurocentric or Afrocentric but is an uneven mixture of both owing to our eclectic cultural practices. America is unique in this regard and we really need to get a handle on defining America and what it means to be an American not an African or a European. It is a matter of accuracy, not white Anglo-saxon, European fake images.